Like a pair of sumo wrestlers, Apple and Google are facing off in the field of iOS mapping services. First Google held the upper hand, controlling the map database underlying Apple’s first Maps app. But in a bold move that was both expensive and ultimately somewhat embarrassing, Apple escaped Google’s clutches by creating a new Maps app and its own mapping infrastructure, relegating Google Maps to a Web browser window. Now Google has returned to the ring with a new Google Maps app that offers all the features that Apple said couldn’t be added to the original Maps app. I doubt we’ll ever know exactly who was responsible for what in the breakdown of that relationship, but regardless, iOS users can now choose between Apple’s Maps app and Google Maps, along with the many other GPS navigation apps like Navigon, MotionX, Garmin StreetPilot, CoPilot, and TomTom. It’s these other companies I feel sorry for, since between Apple’s bundled Maps and the free Google Maps, a commercial app will be a hard sell. The main advantages I see to a paid app (with Navigon being the one I’m most familiar with) are offline access to stored maps (both Apple’s Maps and Google Maps rely on a cellular data connection to retrieve maps and directions) and interface niceties like pausing a podcast instead of talking over it and offering a light-on-dark night mode. Since Google Maps for iOS just appeared, it’s too early to tell if it will have any subtle issues in real-world navigating, though it’s hard to imagine that it would react differently from Google Maps in a Web browser or Android app. The data behind Google Maps may not be perfect, but Google has been refining it for years. Apple took a lot of early abuse for the quality of its mapping database, and most recently, police in Australia warned against using it after having to rescue six motorists who followed incorrect directions into a national park. (Amusingly, police later had to issue a similar warning about Google’s database.) Realistically, though, Maps has likely worked well for the vast majority of its uses, and Apple is constantly correcting user-reported mistakes like the Australian debacle and refining the data through monitoring, just as Google does. 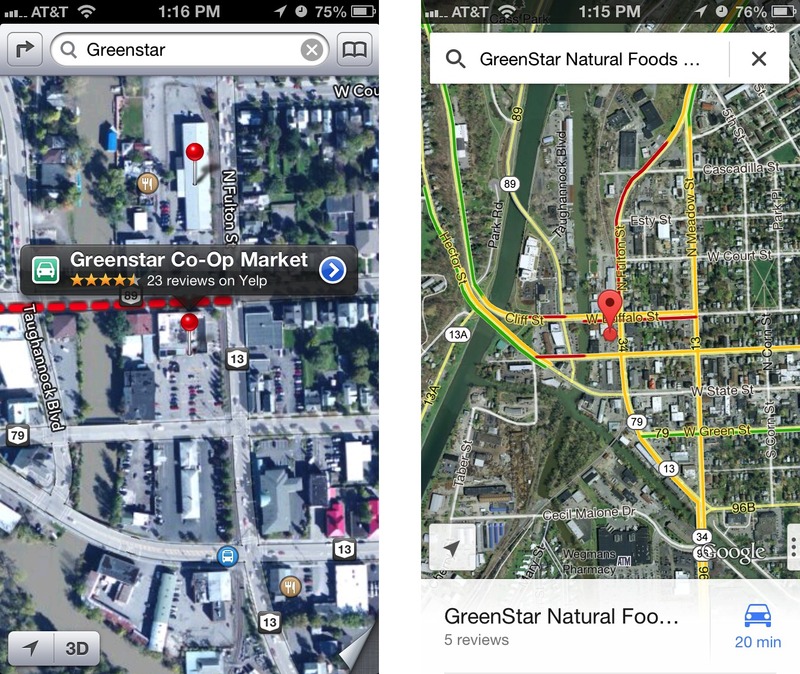 Before we look at how Apple’s Maps and Google Maps compare visually, there are some notable differences. 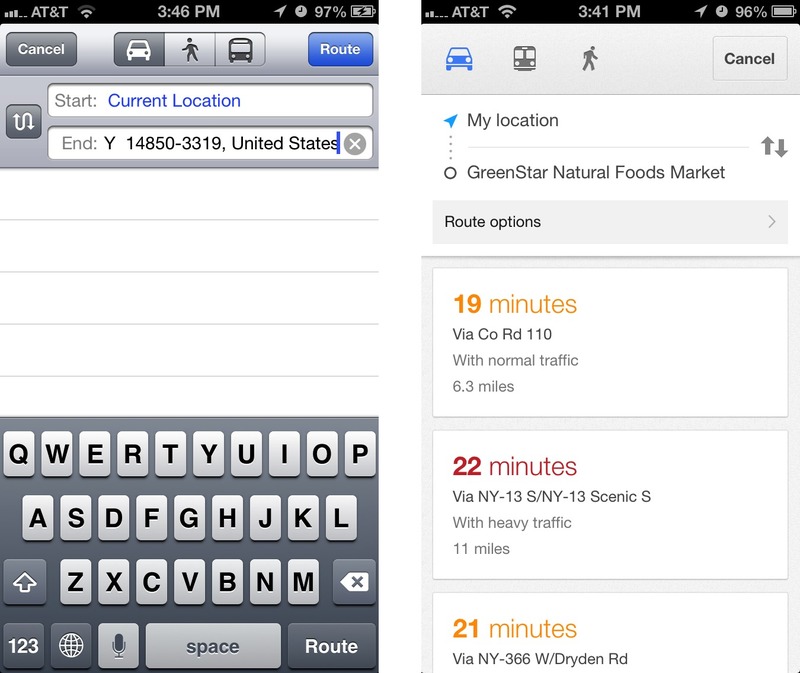 Unlike Apple’s Maps app, Google Maps includes transit directions. For the vast number of iPhone users who live in major cities, this is huge, and may be the main reason people will prefer Google Maps. Interestingly, I just learned yesterday from Rich Mogull that if you ask Apple’s Maps for transit directions (click the bus button), it will feed the associated locations to other routing apps you may have on your device. Better yet, say to Siri, “Give me directions to Joe Schmoe’s house, via transit.” That works swimmingly with Google Maps. Besides this “via transit” trick, it’s not possible to start navigation in Google Maps directly via Siri, as it is with Apple’s Maps. As I become more comfortable using Siri, I find that voice interactions while out and about are increasingly important to me. You can use iOS’s voice dictation to enter search terms in Google Maps, but it’s not the same as talking directly to Siri. Apple has shown no signs of allowing apps from other companies to be accessed via Siri, but perhaps it will happen someday. Similarly, Google Maps isn’t allowed to display its maps on the lock screen or employ a system-wide “Touch to return to Navigation” header, as can Apple’s Maps. Theoretically, Google Maps can display notifications on the lock screen with upcoming directions and will continue to provide voice directions in the background. Google Maps doesn’t ask for or get access to Contacts in iOS, which seems like the sort of feature that will be added in a revision. Nor can it access contacts in Gmail or Google+, which is even weirder. Personally, this doesn’t bother me much, since most of the places I need directions to are not in my contacts list. Again, you can use the “via transit” trick to have Apple’s Maps feed your contacts’ locations to Google Maps. Google Maps asks you to log in to your Google account so you can share searches and saved locations. This isn’t necessary; there’s a Skip button on that screen, but opinions about this are coming down on both ends of the spectrum. Some people object to being asked to log in to an account, whereas others appreciate being able to access saved locations generated in Google Maps in a computer’s Web browser. Google also hides the option to turn off location data collection: to find it, tap the silhouette icon in the upper right corner to access your account, then tap the gear icon, then “About, Terms, & Privacy,” then “Terms & Privacy,” then “Location Data Collection,” and finally, Off. To be fair, it’s not clear to me that you can prevent Apple’s Maps from collecting data at all, since turning it off in Settings > Privacy > Location Services prevents Maps from determining your location at all. Whereas Maps has pictures, Google Maps has Google Street View, at least where it’s supported. I could imagine it being helpful for getting a sense of what a previously unknown destination looks like before you arrive. There are also interior pictures for 100,000 businesses, which is cool, but likely of only sporadic utility. Let’s take a look at how the screens in Maps and Google Maps compare for the same everyday actions of searching for a destination, picking a route, looking at the instructions and more. 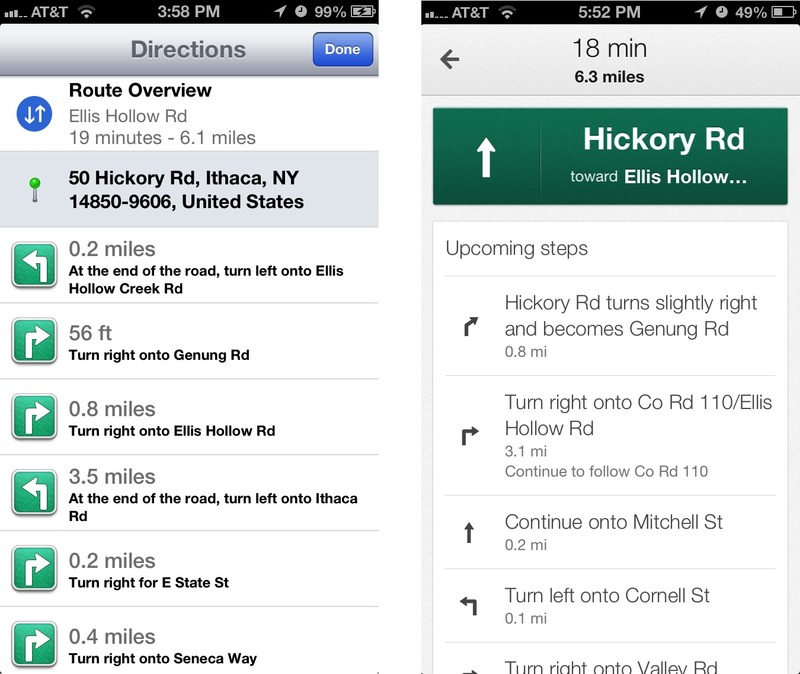 Maps will be on the left, Google Maps on the right. First up is the display of a found business. By default, Maps zooms in more than Google Maps, thus providing more local detail, but at the cost of losing of the neighborhood details that give you a useful overview of where the destination is actually located. Apple does a better job of focusing on the pin, and providing the discoverable right-pointing arrow for more details. But what you can’t see in the screenshot is that tapping the pin in Google Maps causes the bar at the bottom to bounce slightly, and swiping up from it displays more information. It’s more subtle and a bit less discoverable, but equally effective. I do like that Google Maps gives an estimate of driving time, even before I’ve asked for directions. Moving in to the detail views, the main difference is in the graphical look. 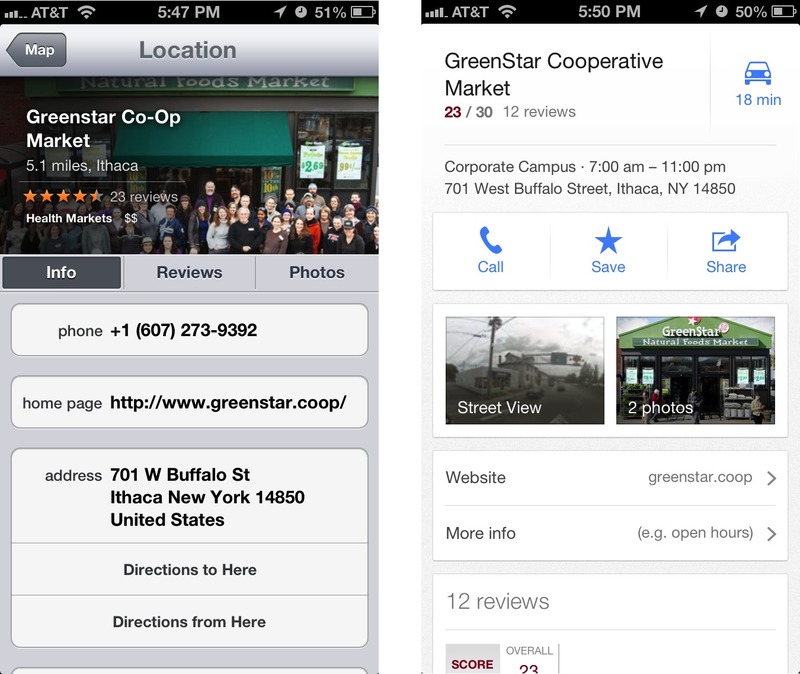 Apple maintains a standard iOS approach, with “tiles” of labeled data, whereas Google Maps utilizes Google’s new look (the recently updated Gmail app is similar). The available data is roughly the same, though Google shows its own data, whereas Apple relies on Yelp. Apple is more clear about how to get directions; with Google Maps, you must tap the car button in the upper right corner, which isn’t as obvious as a Directions To Here button. How about the interface for setting up a route? Both apps require two screens here, so I’ve stacked them below, still with Maps on the left and Google Maps on the right. Apple’s first screen, where you can enter a location and routing type (car or foot, or hand off to a transit direction app) is a bit confusing, since the End field displays the address of the place you just tapped badly. Once you tap Route, though, it’s easy to choose among the different routes by tapping them. Google Maps does better, showing you the name of your selected destination and providing descriptions of the various options, with color-coding for traffic. I hear that the transit directions are particularly good here too — Google Maps doesn’t know about Ithaca’s bus system. Tapping a route on the first screen takes you to the second, where it shows you the graphical view, and where you can tap a different route if desired. Though I don’t have much experience yet, Google Maps seems snappier than Apple’s Maps at bringing in possible routes. Once we actually get into the directions, Apple does some rather odd color coding — I have no idea what the green shading means — and puts up little green street signs, whereas Google Maps eschews the color coding and labels the streets themselves. Apple hides the arrival time and extra buttons behind a tap anywhere on the screen; Google Maps shows a cancel (X) button, the estimated arrival time, and a widget in the lower right corner that can be used to reveal a turn-by-turn list and mute the voice directions. Google wins on discoverability here, since while it’s certainly easy to tap anywhere on the screen, there’s no indication that doing so will reveal Apple’s extra information and controls. Speaking of turn-by-turn directions, they’re comparable in both good and bad ways. Apple shows more turns per screen, with a tighter layout, but Google Maps combines some essentially unnecessary directions into a single step. And while both sets of directions will work, they make the classic GPS/mapping service mistakes that cause locals to shake their heads in disbelief: taking odd turns, referring to streets by unfamiliar names, and ending up on the “wrong” street because the parking lot entrance is on a different street than the business address. Amusingly, Google Maps has a neat “Shake to send feedback” setting — shaking the iPhone in irritation is exactly what I’d do if it made a mistake, and it provides an option to be notified when there’s a fix. The voices didn’t strike me as terribly different, but some have said they prefer Google’s voice. Personally, I’d like a good Australian accent, which makes synthesized voices sound more natural to my American ears. In the end, I believe that the real area where Google Maps stands out from Apple’s Maps is in transit directions, which I can’t test, but which have been praised by city dwellers like David Pogue of the New York Times, and Jacqui Cheng of Ars Technica, Dan Moren of Macworld, and Andy Ihnatko of the Chicago Sun-Times. Otherwise, both apps do a decent job and do so with entirely reasonable interfaces. Apple’s mapping data undoubtedly isn’t as good as Google’s, overall, but in most cases, I doubt that it will make a significant difference. And it’s now easy enough — thanks to the “via transit” trick — to compare routes in both apps, though I suppose that then raises the issue of which you want to believe. I can swipe just fine on the green directions "sign" at the top of the Apple Maps window, but I am using an iPhone 4, which does not have turn-by-turn voice navigation. So I think it might be worth clarifying if what you are describing only happens when you are in the midst of voice navigation. Strange. I can't swipe on the green directions sign at the top of Apple's Maps and have it do anything. So unless that's a feature only on non-voice-capable models, I'm just confused as to the difference we're seeing. The swiping the top works on iPhone 4, but not iPhone 5. Essentially, iPhone 4 is displaying directions the same way that iPhone 5 does for bicycle directions. Don't ask me why. "Although both Maps and Google Maps will show a turn-by-turn list of directions, in Google Maps, you can also swipe horizontally to show the next or previous turn, with the map display. That could be particularly useful when looking through an upcoming route." As described, Apple Maps does this too. 1 Bug I noticed with Google Maps, it doesn't handle rotation of the iPhone correctly (at least on an iPhone 4). I rotated my phone, and while the app did rotate, the map kept thinking forward was in the direction of the front camera instead of the side of the phone that was now the top. Interesting, I'll have to test this the next time I actually leave the house. At least for me now, when I start a route in Maps while sitting at my desk, I can't swipe through the upcoming turns. Perhaps Maps doesn't support this until after the first turn, but that seems wrong, since the main utility for this feature is previewing a route before you've left. I'll see if I can reproduce the rotate bug too. That's the sort of thing that's likely to be fixed in a quick 1.0.1 update. I wasn't able to reproduce either of these. 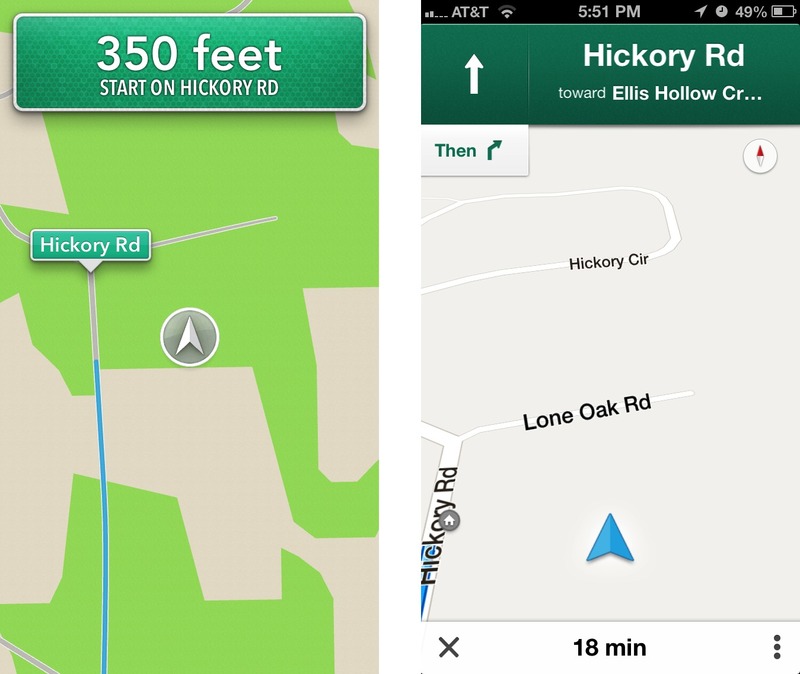 While Apple's Maps was navigating, swiping on the top green box did nothing. And rotating the phone while Google Maps was active worked fine. But wow, is Google Maps bright at night! It really needs a light-on-dark night mode. 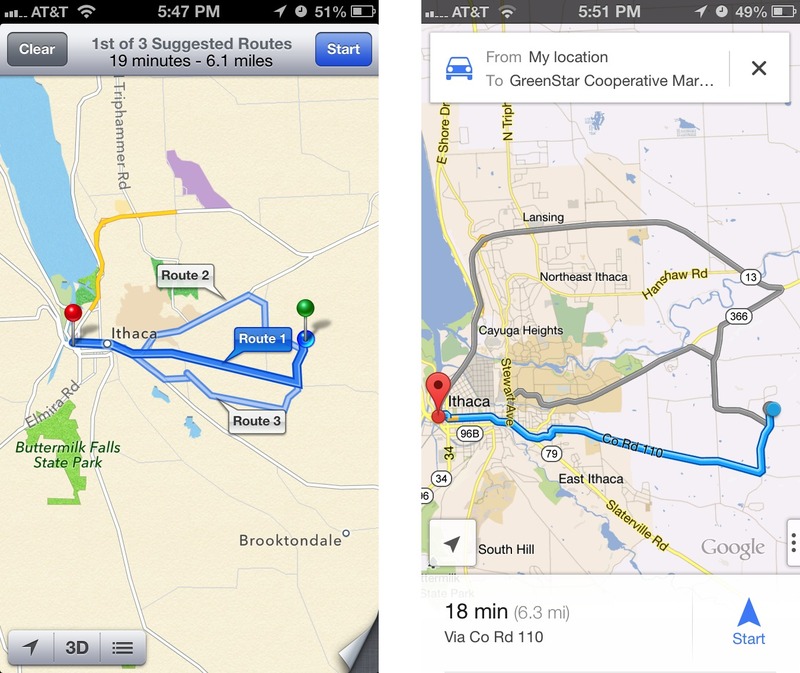 Let's hope Apple fixes their maps quicker than Google did. The "Australia park" problem was frequent in Google Maps too. One example I use is Pt. Mugu State Park in California. Apple has it wrong now. Google had it wrong years ago. I go parks frequently and they (GPS data providers) have trouble sorting out opened roads from closed to motor vehicles fireroads and trails. Navigon will still be essential for me because we go to national parks and other similarly remote places and you can't rely on having a connection. But Navigon is lousy at finding things like parks (and museums and theaters). You can use Google from the app. Navigon shows more detailed information about exit lanes and upcoming turns which is helpful in complicated interchanges. Maybe not a biggee in Ithaca, but it is in LA. Tried this app with my iphone model 4. The first problem I have with Google maps is the ability to save addresses without signing in or creating a Google account. Second is the map area being displayed while en route. In my opinion a huge banner at the top and bottom of the screen really makes is difficult to see where I need to go. Third "unless I was just not doing it right" I was unable to drop a pin on a location. Fourth it seemed with both apps it is way to many steps to recalculate your route. With the original iPhone app it was easy to recalculate how long or far you had remaining in your route at any point along the trip. Now with both apps its seems easier to just start over to get this information. Any thoughts on these issues? Type "210 W 12" or "210 W 12th" and it sends me to 210 Old State Route 12 in NJ. Typing "210 W 12th St" gives me only two choices: Wilmington, DE or Beach Haven, NJ. When I type "210 W 12th St, NY" or "210 W 12th St, New York" it offers three (different) choices, all in NJ. Only when I type "210 w 12th st, New York, NY" does it point me to 210 West 12th St. - about 8 blocks from where I am. And, I've found that if there's the same address in Brooklyn, Maps sends me there even when I type "New York, NY" as part of the address or click on the "New York, NY" address that pops up as a choice. Google Maps recognizes every one of those, including "210 W 12," as the nearby 210 West 12th St.
Also Maps doesn't even show which trains go to subway stations on the map. Click on the station and it gives the address but not the train lines. The caching of map data in Google Maps is especially good news for Touch owners. I caught a cab across Manhattan and my 5G Touch showed our progress the whole way at high resolution, at the same time retaining a high resolution map of my home neighborhood in Queens. I had previously plotted and traced the route in GM on the Touch before leaving my home WiFi. That's really good news! I wonder how long it holds on to cached routes. I had some visiting friends who needed to drive to NYC from Ithaca, and they had only Wi-Fi capable iPads, so online directions weren't really helpful (this was a few weeks ago, before Google Maps). GMaps on Android has an explicit "save this for offline use." I expect that will get to iOS eventually. I've found the apple maps to be poor at giving walking directions too. It has no data on pedestrian only routes (like underpasses) and so routes you along a road instead. Google maps knows about many of the pedestrian routes and does a good job of sending you along them. "Apple is constantly correcting user-reported mistakes like the Australian debacle and refining the data through monitoring, just as Google does." is this really true? I've reported several location errors (mostly misplaced local glyphs for stores) and apple hasn't fixed any of them over the following month. did you actually test by reporting errors and watching for fixes? I don't have personal experience with errors being fixed, but there have been reports from people who saw errors and then confirmed that they had been fixed. And, of course, it would be insane for Apple not to be doing this after the company had to make a public apology based on part on the quality of the map data. Quote: "It’s these other companies I feel sorry for, since between Apple’s bundled Maps and the free Google Maps, a commercial app will be a hard sell. The main advantages I see to a paid app (with Navigon being the one I’m most familiar with) are offline access to stored maps." Not only do the commercial maps offer offline access, their maps are also updated more frequently to reflect changes such as new or changed streets, roads, highway exits and rest areas. I can also used them without accruing roaming and or data charges. Here in Germany cell phone data connections on the Autobahns are really bad or slow. I have an older TomTom Car Kit for iPhone with an integrated GPS receiver which can be used with other companies maps. I acquired the kit as well as TomTom's nav app more than 2 years ago and it has more than paid for itself. The only issue is that the kit can't be used with the iPhone 5 due to the form factor change. Interesting, I would have thought that online map databases like Google's and Apple's could change more fluidly than those where you need to wait for an update and download new maps. I've already said this on TidBITS Talk, but Apple beat Google at two locations in Durango, CO. We have a new roundabout on Florida Rd that Google doesn't know about, and 13th St doesn't connect E 2nd Ave and E 3rd Ave. Google's wrong on both, Apple's right. But then Apple doesn't know that Mercy Medical Center has moved across town and Durango built a new library at 1900 E 3rd Ave, where the hospital used to be. Google's right on both of those. Oddly, Apple shows the new location of the hospital too. It would be interesting to report these errors to both companies and see which fixes them more quickly. Good idea! I reported the problem with the library and the hospital within Apple Maps a few days ago but couldn't figure out how to report the 13th St error to Google within Google Maps on my iPhone. I just reported it on my Mac, and within a minute I got an acknowledgement in my Gmail account. Apple did not respond in any way to my error report. Try shaking the iPhone. :) I can't remember if that's the default setting, but it has a shake to send feedback option. Yes, "shake the phone" appears to be the default setting. I haven't gotten a reply from Google about fixing the E 13th St error, but I just now looked (two days later) and the problem is fixed. I got email from Google this morning saying the 13th Street problem is fixed. Apple still hasn't fixed the library/hospital problem. 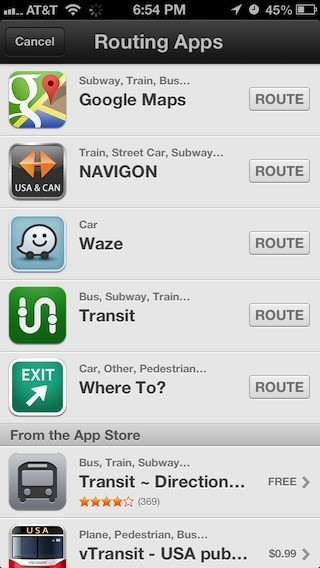 One to add to your list of other nav apps: Waze http://www.waze.com. Adds an element of social networking to mapping and navigation, and a reasonably easy way to edit the map. Also, I believe another difference is that you get turn by turn directions on Google Maps on an older device (I have an iPhone 4), but you have to be on a 5 (perhaps 4S?) to get the same on Apple Maps. Yes, the iPhone 4 lacks turn-by-turn voice navigation with Apple's Maps, so people with that model would likely prefer Google Maps. What's about Nokia/Ovi/Here maps? They are online at www.here.net, but there is also an iOS app. Nokia's HERE Maps app has gotten such horrid reviews in the App Store that I'm disinclined even to download it. But if others want to check it out, here's the link. It is free. Second, not linking to Contacts is a killer for me. I navigate from contacts always. I enter new addresses, from a Google search or other source, into Contacts, select a Map from there, or bookmark to Contacts or Recent routes to select a destination. Google Maps inability with Contacts is a show stopper, as it has been with some of the third party turn-by-turn mapping systems. It is a must. 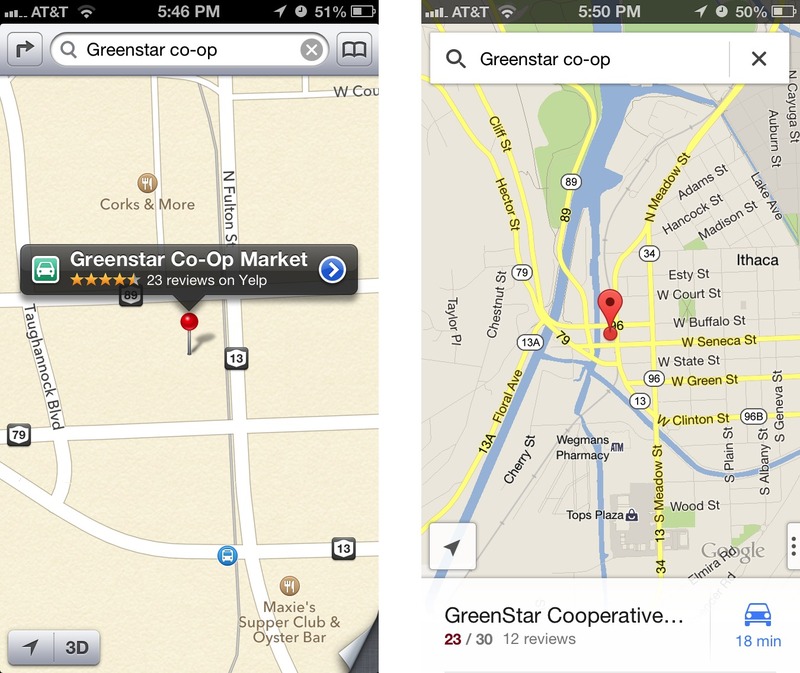 Google Maps is directly linked to Google search, a plus. I tested it using a familiar 45 mile trip to a doctor's. I could not link to Contacts (frustrating), but entered the office name in the Google Maps search field, and it googled and mapped to the address. I have loved Apple Maps since my iPhone5 added Siri, but not on my iPhone4 without voice. I can listen to my audiobook, and Siri tells me where to go, without eyes off the road. Google Maps does the same, but is awkward linking, or requires manual data entry, unsafe driving. Ideally Apple should put google maps & search into Maps. One thing I'd like that I don't seem to have: audio directions when following a walking route in Apple Maps. Am I missing a setting? Works fine when driving. Sometimes I walk in the rain. Two "features" really bug me on Apple Maps (used on a Verizon-iPad3): (1) smaller streets are really faint and barely visible (at least at a distance of > 1 ft). (2) Apple Maps (and probably Google Maps either) doesn't show a scale which makes it really hard to estimated distances. I had at least one instance where I got lost because Apple Maps led me into a dead end in Washington DC which Maps claimed to be a through-street (in September 2012). Maybe Google Maps provides good public transport directions for big US cities, but I have not been impressed with the data or display of public transport directions for Google Maps in my computer's browser in the past. So I never even consider using it. From my perspective, Apple's approach in handing off to the local public transport/cycling/walking routing apps that I already have (and even better, telling me about ones that I don't) is far preferable. These apps are usually far more accurate and provide a more useful interface than a general mapping app does. And I tend to use OpenStreetMap-based apps, so they just have a lot of useful data on non-car paths and routes for cycling/walking.